Origami is an ancient art, but is fun and easy to learn at home! Learn to fold a paper whale with this cool worksheet. It's never too early to make a resolution! Celebrate the autumn season by creating a lovely tree full of healthy goals and resolutions. Learning to fold origami is challenging, but fun! 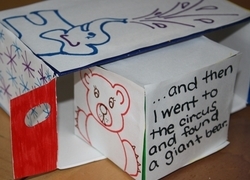 Make your own paper elephant with this cool origami worksheet. Get silly with these cut-out photo props for April Fools' Day! Elmer the Elf is a jolly Christmas puppet that will be sure to put your third grader in the holiday spirit! Bring him to life with this fun paper project. Ring in the holiday season with your third grader! colour in Santa, cut his parts out, and attach them together to create a puppet full of good cheer! Don't worry about buying expensive notebooks for the school year! Print out standard 8 x 10.5 college ruled paper from home with this handy template. 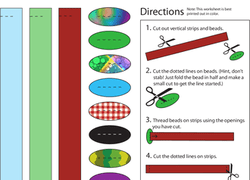 This Father's Day, let your child unleash her inner fashion designer as she crafts a personalized, paper tie for Dad. 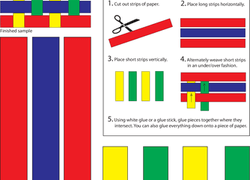 Make reading time a bit more fun with these personalized bookmark cutouts! Your child can colour her own bookmark, and paste a photo on it. Doing origami, the ancient art of paper folding, is a great form of meditation and relaxation. Try making this pretty star, and find your zen! Cow Crafts: It's a Cow Cube! Looking for cow crafts? 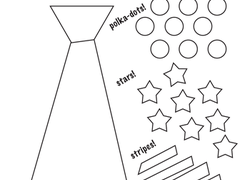 Print out this paper project worksheet to colour and create your own paper cow toy. Make your own 3D origami star by cutting out the strip of paper and folding it according to the instructions and pictures provided.